Well the ship was originally supposed to depart on May 28, but first it experienced generator problems delaying the trip by two days and then there were problems with the salt water holding tank postponing the trip another day. The reason there have been delays with the ship is because the Oscar Elton Sette was originally made for the Vietnam War. It never did see any action, but it is that old. In preparation for the cruise we received a cultural briefing on the importance of the North Western Hawaiian Islands to the native islanders. The natives are very spiritual and believe that the souls of their ancestors travel to these islands. After the cultural briefing, we went to the ship where we were given a brief tour and then loaded 6,000 lbs of bait. The bait we are using is mackerel. The chief scientist, Bob Moffit, informed me that mackerel is good for bait because it is very bloody and oily. Mackerel is considered a constant variable in the lobster study. This means it is something that stays exactly the same during each trial. If they used different bait during each trip they might not know if that affects their results so they keep it constant. Since the trip was delayed I had time to explore the island of Oahu. My hotel was located in Honolulu, the capital of Hawaii. It is a very busy and somewhat crowded place. 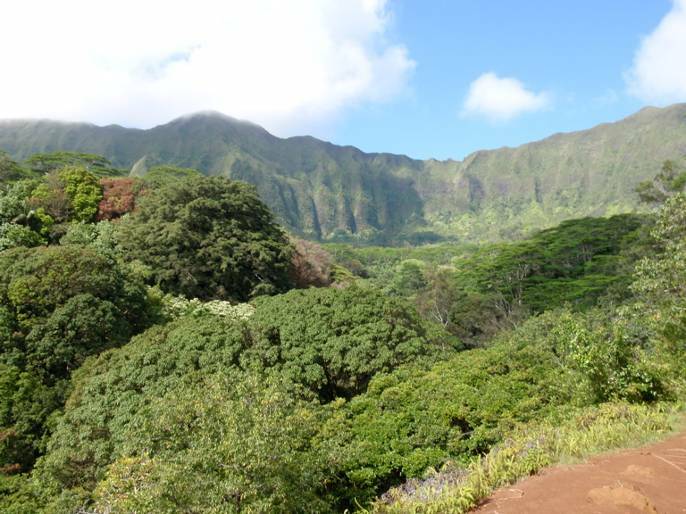 The population of Oahu is around 1million and the entire population of all the Hawaiian Islands is around 1.3 million. So it makes sense that it is a heavily populated area and it is usually the first stop for visitors from the main land, ex. Ft. Lauderdale! This is my room that I share with four other women! I rented a surfboard for an hour at Waikiki Beach and was able to catch a few waves even though the line up was very crowded. I also got to explore the North Shore and see all the famous surf breaks. While there I stopped at a little ice cream shop that had mochi, which is a Japanese food made from sticky rice. This shop just happened to stuff the sticky rice cake with ice cream and it was delicious. My favorite experience so far was hiking up to a waterfall in the forest. 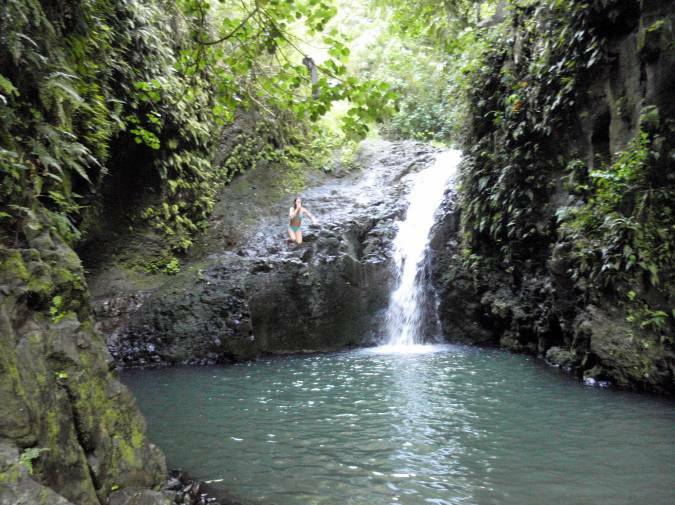 The scenery was very beautiful and when you reached the fall you could climb up and jump of a ledge into a very cold pool of water. I am on the ship now and everyone seems very nice. There are three other women who are considered part of the “science party.” We are all in a room together. The room is meant for six people, but there are only four of us so we have plenty of space and extra drawers for our belongings. I will write again soon! We have been steaming at around 10 knots(approx 11.5 mph) 24 hours a day to our first buoy. The scientists on board are preparing equipment for the work that awaits them once we arrive at our first stop, 0 degrees 01.0 South latitude, 22 degrees 59.9 West. Replacement tubes for the buoys are being readied and the “CTD” is being prepared for deployment. The “CTD” is the name for a package of instruments that is lowered in the water that includes sensors that measure conductivity, temperature and the depth of the seawater. Conductivity and temperature are important since salinity can be derived from these values. 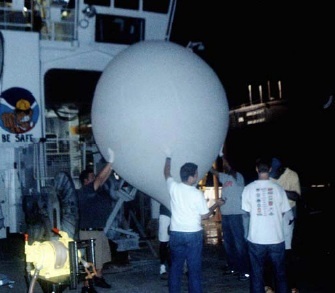 The CTD is connected to the ship by means of a cable through which real-time data can be sent back to scientists on the ship as the winch lowers and raises the CTD through the water. 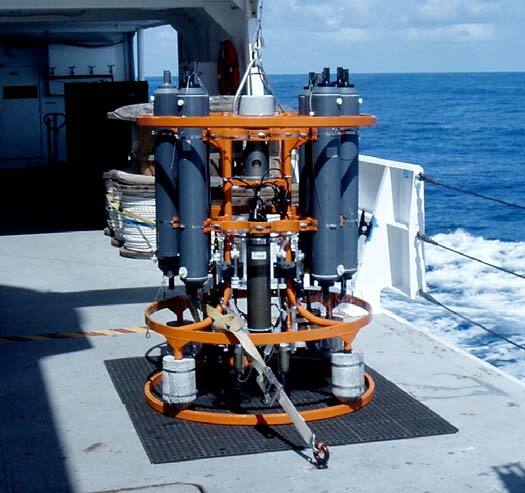 The metal frame around the CTD has a number of bottles attached to it that collect seawater samples at various depths. This water then can be analyzed back in the laboratory when the CTD is brought back on board. We have deployed a number of drifters as we are making our way to the first stop. For the last couple of days, we have not been allowed to collect any data as we traveled through the territorial waters of Brazil. On the night of July 19th we launched an ozonesonde. An ozonesonde transmits information to a ground receiving station information on ozone and standard meteorological quantities such as pressure, temperature and humidity. The balloon ascends to altitudes of about 115,000 feet (35 km) before it bursts. A few days ago, I toured the bridge of the ship. There is always one officer on the bridge and also a person on watch. Unfortunately there is not a big wheel like I imagined up there to steer the ship (I always wanted my picture at one of those big wheels). But there are a number of thrusters that you maneuver the ship with. There are also a number of radar screens that enable one to see surrounding objects and well as computers that allow the ship to run on different auto pilot modes. Before a radiosonde or a buoy is launched, one needs to inform the bridge and the operation is logged in. You really get a unique perspective of the ship from up on the bridge. I have spent hours on deck watching for signs of life out in the ocean. We did have a pod of dolphins of our bow one day, flying fish seem to be out there all the time and one day we believe we saw a pod of false killer whales (maybe). I expected to see some birds, but so far not one. Here I am at the helm of the Brown. 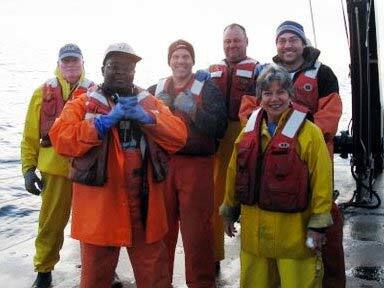 Taking part in the 2009 Sea Scallop Survey has been an experience of a lifetime. I learned how to identify many different species of fish, to use the FSCS computer system, and the many sampling techniques that are involved in fisheries research. I met some incredible people that inspire me to continue volunteering whenever I can for the sake of scientific research. 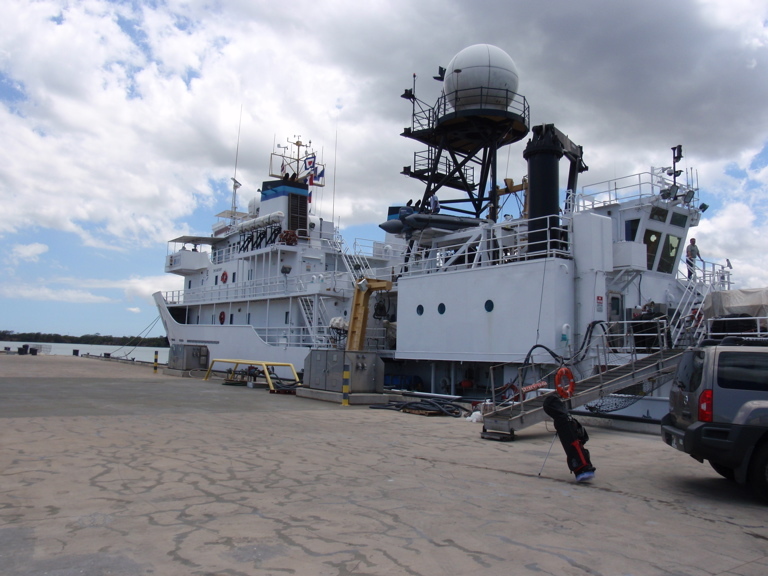 I am very familiar now with many jobs and careers that one can have working for NOAA. My students will be very excited to see all the photographs and data that were collected on this survey. I have planed numerous activities where my students will use the data collected in the sea scallop survey which will help prepare them for the New York Schools Regents Examination. Some research scientists that I have met have promised to come and speak to my classes and educate my students on the many careers that NOAA offers. My roommate Lollie Garay and I had such a remarkable time on the Hugh R. Sharp. Although we worked different shifts, we had a few hours each day to discuss some lesson plan ideas and share pictures with each other. The watch team: (left to right) Gary Pearson, Cristina Bascunan, Vic Nordahl, me, and A. J. Ward. I really enjoyed working with the night watch. My Watch Chief Geoff Shook really knows how to manage a team. He is full of information, patient, and extremely helpful. Cristina, Geoff, Steve, Glynn, A.J., and I really worked well together. The Chief Scientist Vic Nordahl is an amazing guy. He can multitask like no other person I have ever seen. He works on several different tasks at once while checking the data, and even making a little time for Lollie and me too! Kevin McIntosh is another incredible scientist. He and Vic are very busy running the Sea Scallop Survey but he also has made himself very available to Lollie and me whenever we have any questions. Kevin is always there to help with data and explain how different instruments work as well. I really feel privileged to have had the opportunity to work with such a great group of people. I will never forget it! I have taken so much away from this trip, and my students will appreciate all the new knowledge I will continue to share with them. I am very excited to be returning home tomorrow morning. We are expecting a 10-hour steam tonight and hopefully we will arrive in Lewes, Delaware around 6:00 AM. 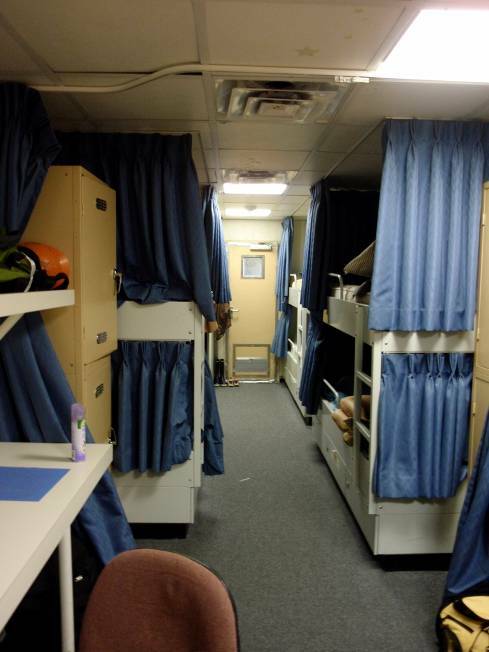 The last thing we have to do tonight is clean our stateroom and the labs. This is easy work compared with all the tows we are accustom to sorting and measuring. Our day began on Station 170 with calm seas, clear skies and warm sunshine. 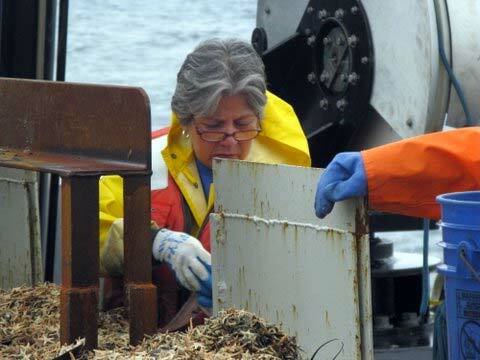 We completed the last sampling tow late in the afternoon and began the final clean-up. All the equipment and gear was washed down and packed. We are now headed back to Lewes, Delaware where our voyage began. Mary Moore waits on the dredge to come in. It’s hard to believe 12 days have gone by already. It has been amazing journey and I have learned so much. The men and women whose work takes them to the seas are to be commended. It is hard work with long hours in all kinds of weather. But in all of science team and crew I sense the pride and the commitment each has for their work. I am going home with stories and images to share with my classroom, friends and family with a first-hand perspective. And I leave my crew with profound gratitude for all they have taught me. I spent some time last night talking with the youngest member of the ship’s crew, Mary Moore. 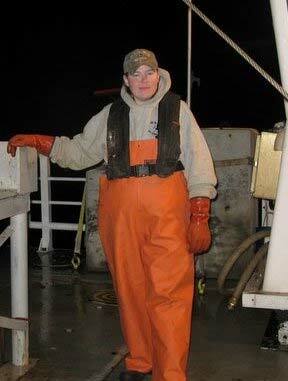 Mary comes from four generations of commercial fishermen. She admitted that she decided early on she did not want to follow her parents’ footsteps .But after looking at other career choices she came full circle and does indeed work at sea. Mary earned a Hundred Ton License which allows her to drive vessels up to 100 tons. She went to school in Florida for Seaman Training where she learned Basic fire-fighting, First Aid/CPR, Survival at Sea, and Personal Responsibility. When I asked her what she liked most about her job or the sea she said, “Just being out at sea–it feels like home.” Watching the last rays of sunlight dancing on the smooth, rolling sea, I can understand what she means. In twelve days I found a personal sense of accomplishment and a love of the sea as well. Today was a great day. It was a little cooler than usual but many tasks were accomplished. I am now able to identify almost every species of fish that comes up in the dredge. I know how to run events and my night watch team works together in harmony. Everything ran so smoothly today, and I believe it is all due to the fact that we get along so well. I have become good friends with everyone on my watch and some day crew as well. Relationships are important when you’re living with all different people in close quarters. I had a chance to talk with Steve Ellis today. 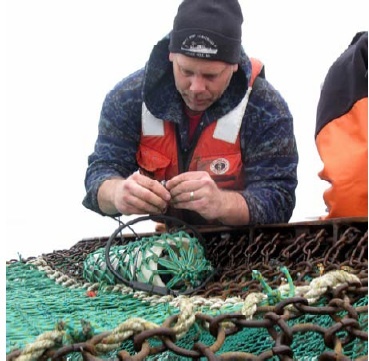 He is a port agent for NOAA Fisheries North East Regional Office. He works with management plans and is a Fisheries Reporting Specialist. Port agents like Steve are stationed where major commercial activity is located. 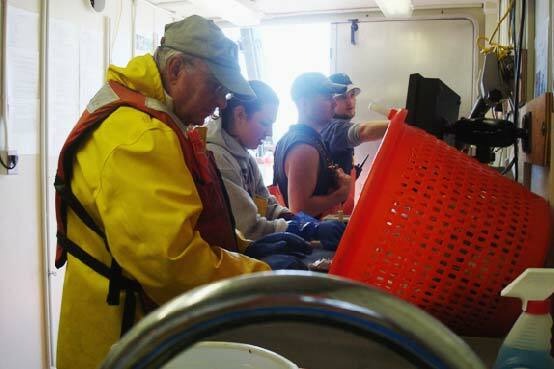 He works under the fisheries statistics office and monitors commercial fisheries landing in order to supply data for proper fisheries management. 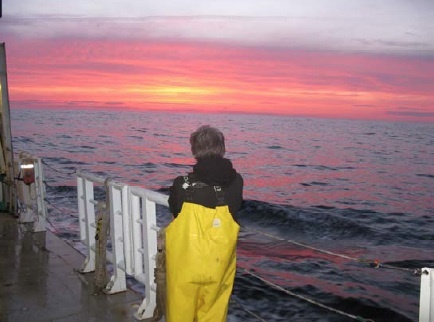 Steve tracks fishery events and maintains reporting requirements that operate in U.S. waters. This helps the government get quota for different species of fish along with their age and growth. This also becomes a part of our Gross National Product. Steve also helps interpret regulations and provides a link between fishermen and managers. I also got a chance to sit and talk with Glynn Rountree. 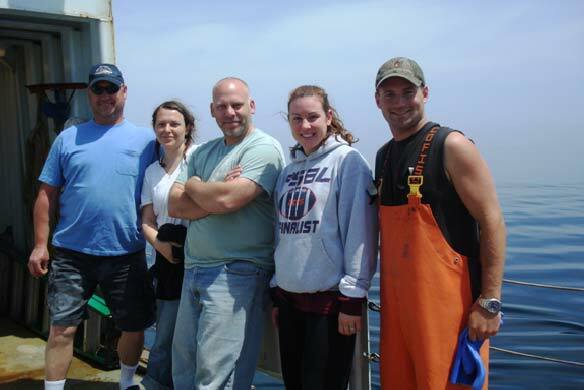 He is a volunteer on this NOAA Sea Scallop Survey and he has been volunteering on many cruises since graduate school. 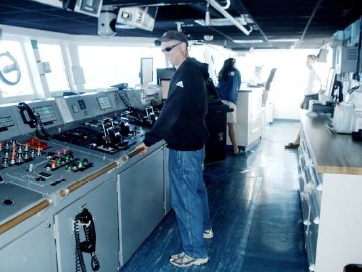 So far he has been a volunteer on at least 50 cruises for the Environmental Protection Agency and NOAA. Glynn has a Master’s Degree in Oceanography and is very helpful in answering almost any question you have about various animals and fish. Glynn worked in research administration for 8 years, and now has a job with environmental regulation of home building. It is important to understand that you do not have to be a scientist to work in a science field. There are so many significant issues that will affect us directly that it is very important we stay educated on issues like global warming, climate change, and endangered species. We need more college students studying these issues not business administration. Windowpane Flounder, Fluke, Sea Cucumber, Gulf Stream Flounder, and Fourspot Flounder. Today a video camera was attached to the dredge. Using the camera they are able to see when the dredge is actually on the ground to determine the amount of bottom contact. It is important to verify sensors like these anytime you work in science. The inclinometer records angle changes that we can interpret into a time on bottom which can be used to calculate a tow distance or bottom contact. 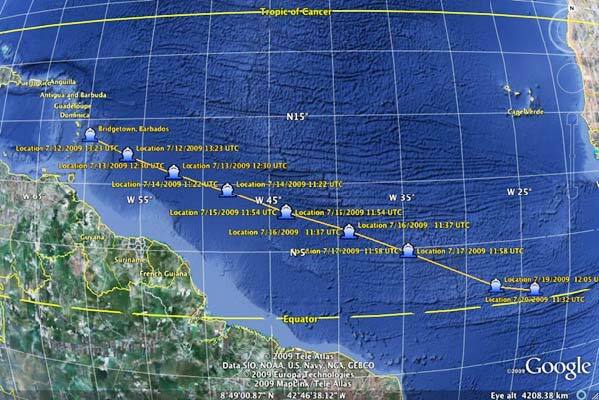 This is compared to the tow distance calculated from the GPS recorded by FSCS. Unfortunately, the inclinometer angle change is not abrupt enough to determine the start time, so the camera is used to determine the amount of time before we start recording tow distance with FSCS. Looking for crabs in a pile of Starfish is harder than you think! We have two days of sampling left and then we begin to clean and pack. The first dredge today brought up so many sand dollars that they had to shovel some away before they could even secure the dredge! 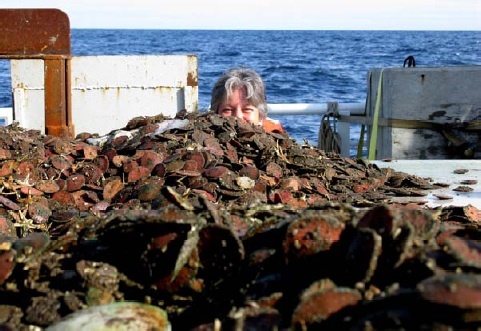 By late afternoon we were back into starfish; in all the dredges the scallop count was comparatively small. Around 4PM the skies cleared and we had sunshine again! It was a welcome sight after days of fog, cloud cover, and cold. That, along with calmer seas, made for a great day. Sitting on deck in the warmth of the Sun watching the wave action, I reflect all the different moods of the sea I have seen. I also think about all the wondrous animals I have seen; and wonder about how much more life there is that we didn’t see. Lollie and a heap of sand dollars! 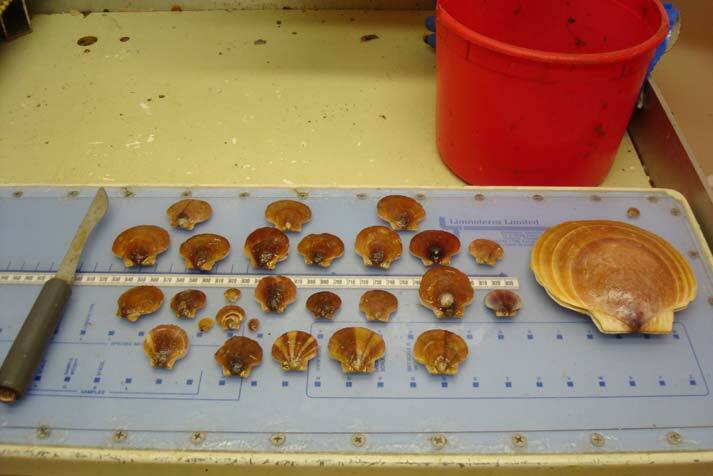 Here you can see the many different sizes of sea scallops. 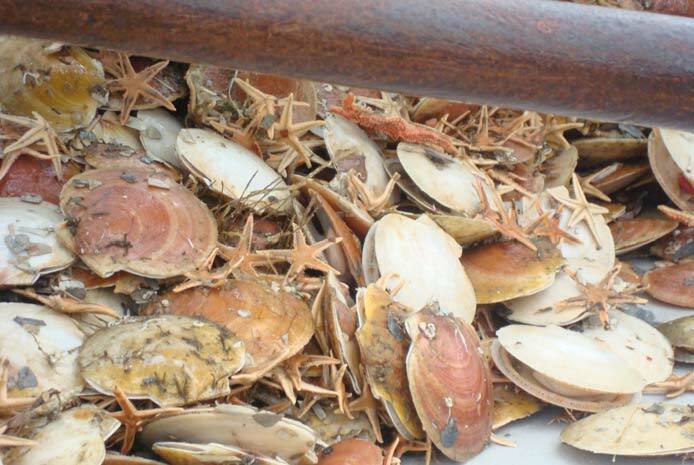 So Far the sea scallop survey has collected 76,170 sea scallops which can also be expressed as 9,251 kilograms. This is a tremendous amount of scallops and the survey is not even a third of the way complete. 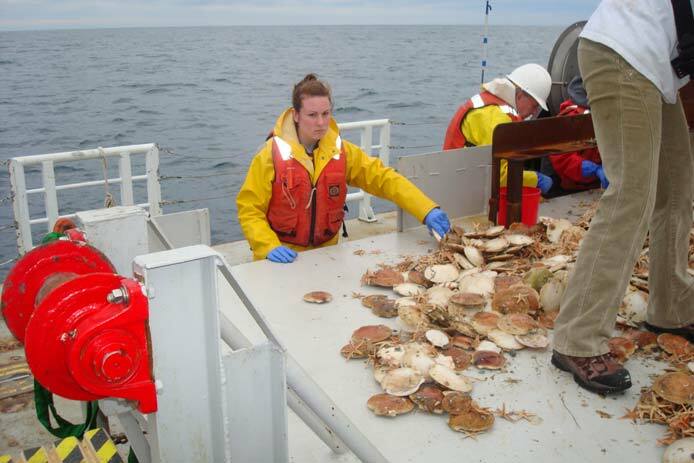 At stations where crabs and starfish were sampled we have collected 8,678 cancer crabs and 279,768 starfish (Asterias) so far. Without a reliable database like FSCS it would be impossible to keep up with such a large amount of information. Today I got a chance to talk with Shad Mahlum. He is a seagoing technician for NOAA and was born and raised in Montana. He has experience working with freshwater surveys. In the past years he has studied how beaver dams influence native and non-native species of freshwater fish. Shad also spent some time looking at various cattle grazing strategies and how they affect food chains. 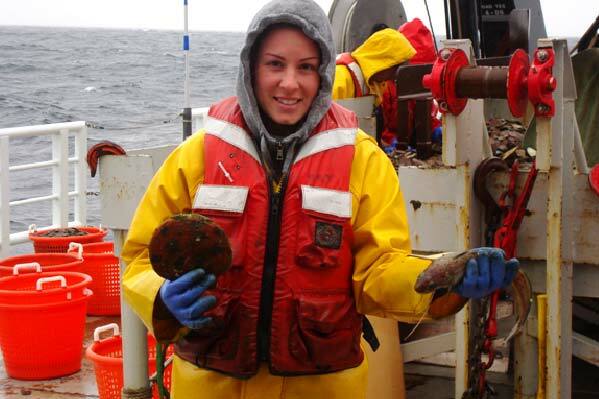 Shad loves working on the open ocean and the physical process of sea scallop surveys. Shad hopes to work with freshwater and saltwater projects in the future. Here I am holding a scallop and a Red Hake. As I was gazing out into the deep blue sea a very large animal caught my eye. I was so excited to see another Finback Whale. They are the second largest animal on earth after the Blue Whale. They are known to grow to more than 85 feet. Finbacks are indifferent to boats. They neither approach them nor avoid them. Finback Whales dive to depths of at least 755 feet. They can grow anywhere from 30-80 tons. Finbacks eat Krill, fish and squid and their population numbers are approximately 100,000 or more. The only threats Finbacks have are polluted waters. It is incredible to see such a large animal breaching out of the water. I will never forget it. Wrymouth Squid, Eelgrass Slug, Razor Clam, Lobsters, Green Sea Urchin, Macoma clam, Sea Stars (Asterias), Horseshoe Crab, Fourbeard Rockling, Palmate Sponge, Hermit Crab, Black Clam, Golden Star, Tunicate, Winter Flounder, Surf Clam, Yellowtail Flounder, and Sea Mouse.